Hello There Fab Free! It’s good to be here. I feel like I have had such a weird week so far, though I couldn’t tell you what specifically was weird about it. Thankfully I have been able to do some shopping therapy, Fab Free style! Belle Epoque has this cute wiggle dress out as one of their group gifts, and I picked up a beautiful upper body tattoo inexpensively at Speakeasy for a modern pinup look. I hope you enjoy it! The Dress – I love the mix of retro and modern present in this dress by Belle Epoque. The fabric has an almost latex like shine to it. This fun dress is a free group gift to Belle Epoque group members. The Belle Epoque group has a one time join fee of just 10 linden. This dress comes in a single Maitreya fit only. The Tattoo – This beautiful floral upper body tattoo is just 50 lindens at the Speakeasy main store. I love how the beautiful roses come around the shoulders and connect in a bow. Also, I think the sphynx kitties near the shoulders are adorable! The tattoo comes in an Omega applier only with 3 opacity options. Categories: appliers, dress, group gifts, mesh, tattoo | Tags: 1950s, 50L Tattoo, 50s Diner, ALMA, BELLE EPOQUE, belle epoque group gift, Boutique 187, Buzzeri, Catwa Koura, empire, Essences, fab free, Fab Free in SL, fabfree, fabfree in sl, fabulously free in SL, Fashion Blog, Fashion in SL, female fashion, Foxcity, FOXCITY Poses, free, free in sl, freebie, Group Gift Dress, Group Gifts in SL, indigo, Indigo Poses, Jukebox, Lisa Walker, Maitreya Lara, Modern Pinup, Omega Applier, Omega Applier Tattoo, Pencil Dress, pinup, Prudence Rexroth, Pumec Ears, retro fashion, Second Life, Second Life Fashion Blog, Second Life Freebie Blog, sl, SL Blog, sl fashion, Speakeasy, Speakeasy tattoo, Time Portal, TRUTH, Truth Hair, Vintage Fashion, Wiggle Dress, [PUMEC] | Permalink. Oh My Goodness, Fab Free’rs, I’m sooo not ready for October to be over! Not only do I love Halloween and want it to last longer, I’m just not prepared to start thinking about Thanksgiving and Christmas. Ahhh! Still, I’m sure I’ll get into the spirit of both up-coming holidays soon enough. For now, here’s one more witchy moment. If you’ve been reading the Fab Free blog for long, you know I adore tattoos. This chest and sleeve tattoo is a free gift by Cheeky Ink. There is also a free tattoo for the guys at the Cheeky Ink shop. No group is needed for either tattoo. The tattoos come in 3 options, a 50% transparency, 75% transparency, and 100% full transparency. This tattoo is an Omega applier tattoo. I could not resist this shimmering pumpkin from Sunora. It’s a cute little Jack o’Lantern with a simple hold animation. I also love the particle sparkles it emits. It looks spooky and magical! You can do away with the particle effect by clicking the jack o’lantern. This little pumpkin is just 50 linden on the Marketplace. Here are the detials, enjoy! Wall Art – Oubliette– Crow Familiars Framed Print – Currently @Trick or Treat Lane *P.S. There’s also a gift until Nov. 2nd! Categories: accessories, appliers, Free, other, poses, tattoo | Tags: 0 free, Applier Tattoo, Boho Couture Fair, Catwa Koura, Cheeky Ink, Cheeky Ink Gift, empire, Essences, Essences Cinnamon, free gift, Free Tattoo, Free Tattoo Gift, Free Tattoo in SL, halloween, holdable pumpkin, indigo, Indigo Poses, jack o'lantern, Maitreya Lara, Omega Applier, Oubliette, Petite Mort, pumpkin, Roawenwood, Samhain, Sunora, Trick or Treat Lane, Wasabi, Wasabi Hair, Wasabi Pills | Permalink. Hello again Fab Free’rs! Thanks for being here. Just like Linus, Pru finds a pumpkin patch to wait in for The Great Pumpkin to appear. Maybe one day he’ll actually appear! This particular pumpkin patch complete with little twinkle lights and pumpkin blossoms is a 10 linden Pumpkin Hunt prize by Lunaria at the Fall Festival for Parkinson’s. Each of the stores has a 10 linden pumpkin, and there are additional pumpkins in the shop booths outside. Most if not all the proceeds from the sales of the pumpkins will go to help fund research for Parkinson’s. I can’t think of a better reason to spend 10 lindens! Along with the dreamy pumpkin patch prize, Pru picked up this cute coffin dress from Grumble. It’s a single strap dress with a spooky cute coffin pattern on the top. The dress is in the 10 linden pumpkin from Grumble at the Fall Festival. It comes in the following sizes: Maitreya Lara, Slink Physique, eBody Curvy, Tonic Fine, Tonic Curvy, Belleza (Freya, Isis, Venus). Last but not least the long dark hairstyle is one of two 10 linden pumpkin prizes by Firelight at the Fall Festival. This style is called Ophelia. The Ophelia hairstyle Pumpkin Hunt gift comes with a black and white color change hud, and has a tinting hud to allow you to add a tint to either color. Categories: dress, events, hair, Home & Garden, hunts, mesh | Tags: 10L hunt, 10L Pumpkin Hunt, Belleza Freya, Belleza Isis, Belleza Venus, Catwa Koura, cheapies, Creations Park, eBody Curvy, empire, Essences Vanya, fab free, Fab Free in S, Fab Free in SL, fabfree, fabfree in sl, fabulously free in SL, Fall Festival, Fall Festival for Parkinson's, Fashion in SL, female fashion, Firelight, Firelight Hair, Firelight Pumpkin Hunt Prize, Grumble, Grumble Pumpkin Hunt Prize, Halloween Fashion, Hunt for Parkinson's, Hunts in SL, indigo, Indigo Poses, landscaping, Lunaria, Lunaria Pumpkin Hunt Prize, Maitreya Lara, Parkinson's Benefit, Prudence Rexroth, Pumpkin Hunt, Pumpkin Hunt Prizes, Pumpkin Patch, pumpkins, Second Life, sl, sl hunt, SL hunts, Slink Hourglass, Tonic Curvy, Tonic Fine | Permalink. Welcome back to the blog Fab Free’rs, and a special hello to the month of October! Sings “It’s the most wonderful time of the year…” Honestly, October is my December, and Halloween is my Christmas. Alright, I won’t subject you to any more of the thought of me singing, but I am still excited about the group gifts from Safira and HEC I have to share with you. The Top – Love reminded me about this recent free group gift out at Safira. She really knows my style so well! The top has a satin-like look to it and is plain in the front with this cutely spooky skull cutout pattern in the back. This cute top comes with a color change hud with quite a few solid color options. The Safira group is free to join at this time, and there are quite a few group gifts available. The Bracelet – One of the most recent group gifts at HEC is this cute bracelet. The letters spell the word HOT which gives this accessory a little sass! This group gift at HEC comes in a left and a right so you can wear it on either wrist, or both. It’s also able to be resized and is unisex. The bracelet has a color change hud with the ability for you to choose a custom color for the letters and the band. The HEC group has a one time join fee of 25 linden. Categories: Free, group gifts, jewelry, mesh, shirt, unisex | Tags: $0L, 0 linden, Belleza Freya, Belleza Isis, Blueberry, Clawtooth, e.marie, Essences, fab free, Fab Free in SL, FabFfree, fabfree in sl, fabulously free in SL, Fashion Freebie, Fashion in SL, female fashion, free, free fashion, free group gift, free group join, free in sl, freebie, group gifts, Group Gifts in SL, HEC, HEC Group Gift, Hot Elegant Clothing, indigo, Indigo Poses, Maitreya Lara, Prudence Rexroth, Safira, Safira Group Gift, Second Life, SilentSparrow, SilentSparrow Tattoo, sl, sl freebie, Slink Hourglass | Permalink. Hello Fab Free’rs! Thanks for being here. I have a quick post for you today. Trashed put out new group gifts recently. There’s a gift for the ladies, and one for the guys too. The leather and animal print bustier style top Pru has on is the new female group gift at Trashed. There’s a small 2 linden join fee for the Trashed group. Just wear your tag and click the group gift vendor and your top will be delivered to you! Categories: Uncategorized | Tags: Addams, Animal Print, Belleza Freya, Belleza Isis, Belleza Venus, Blueberry, Blues Rock Cafe, Catwa Koura, eBody Curvy, Essences, Essences Vanya, fab free, Fab Free in SL, fabfree in sl, Fabree, fabulously free in SL, free group gift, group gift in SL, indigo, Indigo Poses, Letis, Letis Tattoo, Maitreya Lara, Prudence Rexroth, Second Life, sl, SL Cheapie, sl freebie, Slink Hourglass, Slink Physique, Trashed, Trashed Group Gift, TRUTH, TRUTH VIP, TRUTH VIP Reyane | Permalink. Hello Again Fab Free’rs! I hope anyone out on the U.S. East Coast is keeping safe and as dry as possible. Today I have some super cute what I like to call “cheapies” to share with you. I picked up these pajama pants from Petite Morte, and the tattoo is from Moon Tattoos. Both bargains are too good to pass up if you ask me! The Tattoo – This cool unisex tattoo is a Marketplace bargain from Moon Tattoo. The tattoo is priced at just 59 linden (as are many of the tattoos at the Moon Tattoo Marketplace Store). It comes in appliers, and there is a classic system tattoo layer making this tattoo suitable for both mesh and classic avatars. The Pajama Pants – I love these pajama bottoms from Petite Morte. They are exactly what I want to wear when I’m around the house. Right now Petite Morte has a selection of 3 different novelty pajama bottoms for sale at just 50 linden per style. If moons and clouds aren’t your thing, there’s a cute kitty print, and some piggies to choose from. These won’t be 50 linden forever, so make sure you pick a pair up sooner rather than later. You’ll find them at the Petite Morte store next to the Lucky Letter boards. Categories: appliers, classic avatar, Marketplace, mesh, sleepwear, tattoo, unisex | Tags: $50 Lindens, 50 linden, 50L, bargain, Belleza Freya, Belleza Isis, Belleza Venus, Catwa Koura, cheapie, cheapies, Clawtooth, Crescent Moon, Essences, fab free, Fab Free in SL, fabfree, fabfree in sl, fabulously free in SL, female fashion, indigo, Indigo Poses, Maitreya Lara, Marketplace Cheapie, Marketplace Tattoo, moon, Moon Tattoo, Petite Morte, Petite Morte Promo, Poetica, Prudence Rexroth, Second Life, sl, SL Bargain Shopping, SL Cheapie, Slink Hourglass, Slink Physique, system tattoo layer, The Mesh Project, TMP, unisex tattoo, Wetcat, WetCat Backdrop | Permalink. “Have you ever been (have you ever been) to Electric Ladyland? The magic carpet waits, for you. Hello Fab Free! I’m in a terrific mood. I had a great Monday. Maybe it’s contagious, I’ll do my best to share the positive vibes with you! Part of my happy day is getting to share more gifts and freebies with you. I picked up a few more of the Women Only Hunt gifts, one from DM, and one from YUMZ. I also got my hands on the TRUTH August VIP gift. Keep reading for all the info! The Sunglasses – These retro looking metal framed sunglasses give me all those late ’60s -’70s groovy feels. They are the free Women Only Hunt gift at DM. 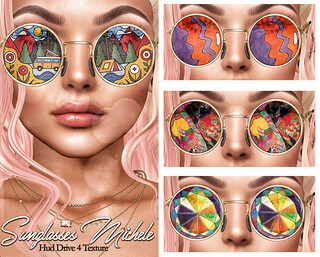 These super cool glasses come with a texture change hud that has 4 colorful transparent graphic options to choose from. The glasses can also be sized via touch menu. The Outfit – What little bit exists of these short short short shorts is really quite cute. The matching crop top is also included with this free Women Only Hunt gift from YUMZ. The set includes the shorts in 2 camo print versios, and the shirt comes in 4 colors. There are several sizes for both the shorts. The Hair – This cute long hairstyle is the August VIP gift from TRUTH. The hairstyle comes in a complete fat pack of color huds, and has a stylist hud so you can change up the look of the style with several options for how the lair lays. I personally love the little braids, I used to wear my hair very similarly. The TRUTH VIP Group has a one time join fee of 350 linden. Categories: accessories, Free, group gifts, hair, hunts, mesh, pants, shirt, unisex | Tags: !dM, Belleza Freya, Belleza Isis, Belleza Venus, Catwa, Catwa Koura, DM Mainstore, DM WOH Prize, Essences, Essences Blake, fab free, Fab Free in SL, fabfree, fabfree in sl, fabulously free in SL, Fashion Freebie, free, Free Fashion in SL, free hunt, free hunt gift, Free Hunt in SL, Free Hunt Prize, free in sl, freebie, group gift hair, indigo, Indigo Poses, Nar Mattaru, Nar Mattaru Tattoo, Oh Snap!, Oh Snap! Backdrop, Prudence Rexroth, Second Life, sl, SL Fashion Blog, sl free hunt, sl freebie, sl freebie blog, SL Freebie Fashion, sl hunt, Slink Hourglass, Slink Physique, TRUTH, TRUTH VIP, TRUTH VIP August, TRUTH Yuko, WOH, WOH Prize, Women Only Hunt, YumZ, YumZ WOH Prize | Permalink. Hi There Fab Free! I have something a little different to help brighten your week. The iridescent harness style lingerie is a new Lucky Letter board prize at Moon Amore. I had fun pairing it with the group gift horns from Cubic Cherry. I think the end result is both sweet and sensual. I hope you like it as much as I do! The Lingerie – I love this unique lingerie set from Moon Amore. I think that even with the influx of harnesses and harness inspired fashion, this stands out. The set has a separate top and bottom so you could wear the pieces alone as well as together. This Lucky Letter board prize also has a color change hud that lets you choose pink, yellow, or blue (shown) for the base color of the iridescent straps. Also, the set is in a single mesh size. The Moon Amore group has a one time join fee of 30 linden and is required to win the Lucky Letter prizes. The Horns – These cute down-turned horns are a recent group gift from Cubic Cherry. They come with a color change hud with 6 fun candy colors. The Cubic Cherry group has a one time join fee of 66 linden. There are several group gifts available at Cubic Cherry in addition to these fun interesting horns. Categories: accessories, fantasy, fetish, fitted mesh, group gifts, groups, lingerie, Lucky Board, mesh, other | Tags: Aii, Catwa Koura, Cubic Cherry, Cubic Cherry Group Gift, demon, Demoness, Essences, Exile, Exile Hair, fab free, Fab Free in SL, fabfree, fabfree in sl, fabulously free in SL, Fashion in SL, female fashion, free fashion, group gifts, harness, indigo, Indigo Poses, Iridescent, kawaii, Lucky Letter Board Giftg, Lucky Letter Board Prize, Maitreya Lara, Moon Amore, Moon Amore Lucky Letter Board, pastel, Prudence Rexroth, rainbow, Role play, Second Life, Shiny Stuffs, sl, sl freebie blog, Succubus | Permalink. Hello, fabulous readers! I’m finally feeling the holiday spirit, thanks to some amazing gifts and deals. So hang on to your sleigh – we’ve got a lot to cover here! I was so thrilled when I got the notice that LeLutka was sending out their annual Spirit Tree. This year’s tree is a beauty: snowy green with big, silver decorations. And the best part is that it’s completely FREE! Just join the LeLutka in-world group (NOT the LeLutka For Me users group) and save a copy from the notices. Or head over to the store to pick one up, if you’d rather. Lots of past group gifts are available (including FREE hair), so be sure to grab those as well, if you haven’t already done so. The Spirit Tree is resizable with a right-click > edit > stretch. Be sure to watch your land impact, because the tree gets more “primmy” as it gets larger. [CIRCA] Living is hosting their 8th Annual Advent Calendar, and the gifts are really lovely! From Dec 1 – 24, [CIRCA] will be offering a new advent item (up to 4 per day) in a numbered square. This works similar to previous years except there is a new in-world group to join: [CIRCA] Living – Christmas Advents. It is free to join – just look for the RED group sign beside the large Advent tree on the wall. You must wear your group tag (see above) to buy the contents of each square, except for the 0L surprise days. Each item will be 1L – 75L for any given day in the Advent tree. You can purchase any or all of the gifts for that day. Sometimes there will be bonus squares on surprise days for an extra gift or color variation for group members, so don’t miss those. On the Eve of Dec 24th, the group will be closed. Those still in the group at that time will receive the final gift on Dec 25th. Sample items are on display in the store, and more will be displayed as the days go on. Each day’s gifts are only available for 2-3 days at a time, so don’t wait too long to check them out! At the time of this post, days 9 – 12 are still available for purchase, including a really cute FREEBIE on day 9 (you want it, trust me). I’m not feeling the blues, but I’m definitely wearing them! Not long ago, we welcomed I.M. 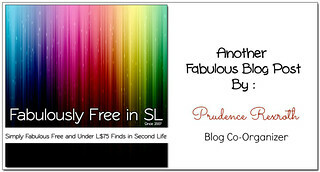 Collection to the Fab Free Designer family. This made me happy because I really love their stuff (in case you hadn’t noticed, lol)! So today I’m wearing I.M. Collection’s new gift for Fab Free group members, which includes both the dress and heels. Dress sizes include Belleza, Maitreya, and Slink, as well as a Fitmesh version. The shoes are sized for Belleza, Maitreya, and Slink mesh feet. To pick up your gift, pop on your Fabulously Free in SL group tag and head over to the I.M. Collection in-world store. You’ll find the Fab Free gift next to the fireplace around the corner. Seriously, I am really loving these nails from LIVIA. And the best part is that they are a completely FREE gift for the Women Only Hunt 4. The Snow Royale nail appliers work on Slink and Maitreya mesh hands, as well as hands that are Omega compatible, such as Vista and Tuty (Omega installer sold separately). Four different designs are included, so depending on your hands, you can wear all the same design, or different designs on each finger, as I’m doing here. Before I end this very long post (sorry! ), I want to mention my necklace, which was an Advent calendar gift from Snowpaws. The Metal Snowflake Necklace was the gift for day 4. It is not resizeable, but you can reposition it. Categories: accessories, december advent, dress, FabFree Group Gifts, gacha, Home & Garden, jewelry, Nails, shoes | Tags: amala, arise, belleza, fab free, fabfree, fabulously free in SL, Fifty Linden Friday, i.m. collection, Imeka, indigo, Izzie's, Jian, lelutka, LISP Bazaar, Livia, powder pack, Second Life, Serena Snowfield, sl, SLink, Snowpaws, StoraxTree, The Liaison Collaborative, Truth Hair, What Next?, WOH4, Women Only Hunt, [CIRCA] | Permalink. Hello hello Fab Free’rs! Can you believe it’s nearly December?! It seems like just a little bit ago we were talking about Halloween and now Thanksgiving has come and gone. We have been having such mild weather where I live that it doesn’t feel like winter is on the way. I suppose that’s one of the fun things about Second Life, it can be any season you like at any time, and the weather never affects your wardrobe. The cute knotted tank top Pru is wearing is a recent group gift at Sass. I love the silliness of the dancing/posing unicorn. Unicorns are always awesome anyway. This FREE group gift from Sass comes in several mesh sizes. To get yours head over to Sass and join the FREE-to-join in world group, then click the gift vendor while wearing your group tag. There are quite a few group gifts up for grabs at Sass, so don’t miss out! Speaking of cute and awesome, I think this hairstyle from Exxess definitely fits both categories. Not only is the snowflake headband super fun, it also has a color change hud with several preset colors to pick from. The hud also lets you change the color of the snowflakes and the band part of the headband separately. Also, this hairstyle from Exxess is animated! There is a “Breeze” version of this style that has a little movement to the hair which gives the illusion of wind. How do you get your copy of this playful winter hairstyle? You can get it on the Marketplace for just 1 linden. There are two color huds for the hair with tons of color options. Categories: dollarbie (1L-3L), Free, group gifts, hair, Marketplace, mesh, other, shirt | Tags: Animated Hair, Catwa, Catwa Sofia, Essences, Essences @Shiny Shabby, eXxEsS, Exxess XMas Hair, fab free, Fab Free in SL, fabfree, fabfree in sl, fabulously free in SL, Fashion Freebie, Fashion in SL, free, Free Clothes SL, free fashion, free group gift, Free Hair, Free Hair in SL, free in sl, freebie, indigo, Indigo Poses, Maitreya Lara, marketplace dollarbie, Prudence Rexroth, sass, Sass Group Gift, Second Life, Shiny Shabby, sl, Snowflake Headband, Unicorn Shirt | Permalink.